Autumn brings a chill to the air, falling leaves and the smell of wood smoke on frosty mornings. It also finds wildlife preparing for winter in various ways. Canada geese take to the skies in loud, south-bound V’s, distancing themselves from plummeting temperatures and freezing lakes. Black bears are eating machines, packing on fat to see them through a long hibernation. The tiny Eastern chipmunk has been busy since spring, preparing for the coldest season by “scatter hoarding” – stashing seeds, bulbs, fruits, nuts and fungi in various pockets throughout its territory. 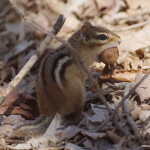 Sometimes the food is eaten promptly, but it’s often relocated to one of many storage chambers within the interconnected burrows that make up the chipmunk’s underground nest. 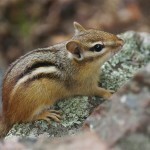 Expanding cheek pouches in its mouth function like grocery bags, enabling the chipmunk to move lots of food in one trip. Hoarding helps ensure ample nourishment throughout the winter, much of which the chipmunk spends snoozing inside its nest. Snowpack and weather influence the duration of this inactive phase. In our region, this generally spans from mid-November through late March or April. Since the chipmunk doesn’t store fat, it’s not a true hibernator. It rouses from periods of torpor to eat from its caches and may leave the burrow to forage during mild spells.